The main reason why to buy and use kiln dried logs is that you always know what you’re getting – logs that have being placed in a large heat and humidity controlled kiln and left for days until the moisture content reaches the desired levels – normally less than 20%. The incredibly high temperatures of the kiln combined with the low humidity draws the moisture out of the logs quickly and effortlessly. When buying seasoned logs, you have to take the processors word that they’re “seasoned”, which is an ambiguous term which unfortunately means very little. They could have air-dried for 6 months or 3 years, and you’ll never know unless you test the logs yourself with a moisture meter before purchasing – including splitting the logs and checking the internal moisture content, which can differ far greatly in seasoned logs due to the nature of traditional air-dried logs; they don’t release their internal moisture as easily as when kiln dried, and logs that measure 20% on the outside could be 40% and wet on the inside. Most seasoned logs from local suppliers start at 25% and upwards to 40%, depending on how long they have been left to dry out, and over time will cause significant damage to your stove and flue lining, causing high levels of creosote and tar build-up. Very well seasoned logs that are below 20% are extremely hard to find, as keeping up with demand in a market that’s growing so rapidly due to the popularity of wood burners is difficult for traditional suppliers to accomplish, hence the growing demand for ready to burn kiln dried logs. Kiln dried logs carry a higher price than traditional air-dried logs due to the higher efficiency and quality that they offer – so much so that one kiln dried log can provide the same amount of heat as 2-3 regular seasoned logs – meaning you only need 1 log on your stove at any time for excellent heat output; this is where the true value of kiln dried logs are. Because sellers of kiln dried logs only need to hold enough stock to keep up with current demand, it’s far easier to manage stock levels and stock can be ordered in from producers within weeks and not years. This means no matter what month or season we’re in, even February when almost every traditional supplier has run out, you can always guarantee sellers of kiln dried logs will have stock available for you if you find yourself running low near the end of the season. View our kiln dried logs to see all of our buying options. The reason our kiln dried log crates are our best-selling product to users of wood burners and why we recommend buying our crates above our other products is because the difference between stacked vs loose firewood is huge – the basic formula is you multiply the stacked volume by 1.7 to find the equivalent loose volume. The photo to the right is the result of us emptying our Extra Large Crate and throwing the logs loosely in to standard IBC cages to demonstrate just how much value you’re getting for your money when buying stacked crates. Our customers are often shocked at the sheer volume of wood in our small and extra large crates when working their way through them – even the small crate goes a very long way and will see most casual users (evenings and weekends) through the entire season, without requiring a top up. To browse the rest of our products, visit our shop now. Do Kiln Dried Logs Burn Longer & Slower? One of the main benefits of burning kiln dried logs is that they burn much longer and slower than seasoned and semi-seasoned logs. This is because most seasoned logs with higher moisture content (above 25%) require you to keep your stove vents open to feed oxygen in to your stove to keep your fire burning – this is because much of the energy is being used to boil off water and thus not enough heat is being generated to sustain a decent fire – there is simply too much water in the logs. Keeping your vents open to sustain a fire is very inefficient, burns through wood much faster and is not how stoves are designed to operate. With kiln dried logs, because there’s so little moisture in them, once your fire is going you can completely close your vent down, meaning you don’t have to force induction of oxygen and speed the burn rate up – you can simply let the kiln dried wood burn effortlessly and much slower than regular seasoned logs. In addition to this, hardwood logs burn much longer and slower than softwood species, therefore we always recommend burning kiln dried hardwood logs. To learn more, visit our homepage or view our logs here – we only sell premium kiln dried hardwood logs for the reasons above. 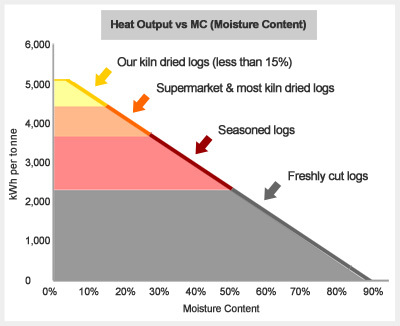 Despite how it may appear and the tendency to worry that your kiln dried logs may end up wetter than when you purchased them if storing outside or in a garage, how you store kiln dried logs to ensure they remain in the same condition you bought them is actually very simple – especially if the moisture content is below 20%, as the kiln dry process changes the properties of the cells in the wood and inhibits their ability to re-absorb moisture from the surrounding atmosphere. Over very prolonged periods, you may find that logs stored outside may very slightly re-absorb some moisture from the atmosphere, but no more than a few % and we’re strictly talking about the very outside of the logs that are exposed to the humid air, which is completely negligible in terms of performance and heat output. 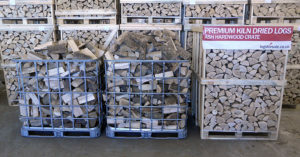 While seasoned logs will re-absorb moisture more readily during humid conditions, kiln dried logs aren’t as quick to do so, and providing they are kept in a relatively dry place or under cover, even when stored outside, they will be just as ready to burn as when you first purchased them, even months later. Due to the very low moisture content of our logs in particular – less than 15% – you can keep them all in the original packaging exactly how they arrived, and not worry about mold growth. The same cannot be said for much of the kiln dried logs sold in supermarkets and large chain stores, where moisture content is very hit and miss, and often stated as up to 30%. As the best method of storing your logs is somewhere with good air-flow and under cover, open fronted log stores are the ideal solution. 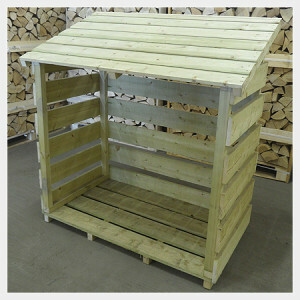 If you are considering purchasing a log store, we recommend one with gaps in between the boards for air to pass through (such as our small log store pictured to the right, or our extra large log store), and not an enclosed one – keeping logs in an enclosed space without room to breath will quickly cause damp and mould to develop. Are Kiln Dried Logs Worth it? Stove manufacturers, installers, chimney sweeps and log suppliers like ourselves are all recommending kiln dried logs for wood burning and they are quickly becoming the preferred choice by those that heat their home with wood fuel, but are kiln dried logs worth it or is it all just hype? In order to fully understand why the dramatic shift to kiln dried has happened, let’s start with how people used to burn wood and why. The traditional way of buying firewood operates like this – a tree surgeon or farmer would fell trees, cut, split and stack them using air to naturally season and extract the moisture out of the logs over a prolonged period, often a year, after which it was considered suitable for burning on fires and in stoves, and by suitable I mean by using lots of kindling a fire could be started and kept going, albeit with a lot of effort and certainly not efficient in regard to the heat output. The better and most reputable suppliers of seasoned logs allow their logs up to 2-3 years to dry out, however as this takes up so much space, very few do this and finding seasoned logs that are low in moisture are extremely hard to find, with the British climate making it difficult to achieve the very low moisture contents that kiln drying can achieve. Most seasoned logs on the market fall between the range of 25-50% moisture content, depending on how reputable or unscrupulous the supplier is – often when winter is in full swing, some traditional suppliers are all out of dry stock and will often sell next years logs which are still drying and almost freshly cut. The calorific content of most seasoned logs falls anywhere between 2,300-3,500 kWh/tonne. Most kiln dried logs (such as ones bought in the supermarket or at stores like BNQ etc) fall between 3,600-4,500 kWh/tonne, a significant increase of heat output at almost twice that of most seasoned logs. Our kiln dried logs are below 15% moisture content and generally fall between 7-15% MC, putting their calorific value between 4,500-5000 kWh/tonne, giving off a staggering amount of heat and meaning just one of our logs contains at least twice the energy of most seasoned logs, allowing you to use half the amount of logs when using your stove. When you compare the heat output of kiln dried vs seasoned firewood, along with the price, kiln dried logs are certainly worth it, especially when you consider they won’t cause damage to your stove or flue like most seasoned logs on the market that are above 25% moisture content will over time. Click here to view all of our kiln dried logs and various buying options. We have compiled a list of 3 things we think you should know when choosing to buy your firewood online. A driver pushing one of our small crates close to a customers home. When companies are sending firewood nationwide like we do, there’s only one way to deliver it – using national pallet networks such as Palletways or Palletline. Delivery is usually made on a 7.5t or 18t vehicle with a tail-lift – the driver pushes your palletized order on to the tail-lift and lowers it to the ground, and providing the ground is smooth your firewood can be pushed with the pallet truck to a convenient place. In the worst case scenario the driver may need to leave it “kerbside”, which means by the side of the road near your property or down your cul-de-sac close to your driveway, for example. With pallet networks having multiple hubs around the country, they are fast, affordable and efficient, meaning you can have your firewood delivered next day if you wish – very important during winter and you’re running low on stock! We offer customers free 2-day Delivery, Next Day, AM and Saturday deliveries for convenience, and even the option for your order to be left near your home or driveway without you present for delivery. When buying firewood online the most important thing asides security (more on that shortly..) is seeing good, close-up images of the logs you will be buying – if a company is using “stock” images with white backgrounds, with no close-ups of the logs themselves in order for you to assess their quality and dryness by looking for cracks in the wood, then we would advise staying clear – the firewood market is growing ever popular and not all producers follow strict quality control and standards. We offer close-up shots of all of our firewood so you know exactly what you’re buying, and we don’t use generic stock images – we operate from our own warehouse, take our own calls and take photos of all of our products inside our warehouse ourselves. Much of the firewood available online is imported straight to fulfillment warehouses where staff are simply there to field calls and pick and pack items, without the skills or knowledge of firewood and operations run in this way are prone to quality issues. We prefer to deal with everything in house to ensure we know exactly what we’re selling, what’s coming from our producers and what our customers will receive after purchasing their wood. When directing to the payment form, there must be a padlock or security symbol in your address bar confirming the credit card details you enter are only being transferred to the payment provider themselves (such as SagePay), and not to pass through the suppliers website. This ensures your vital details are encrypted and you can be confident they’re safe. We take payments through SagePay – the UK’s leading and most trusted online payment processor, to ensure our customers payment details are 100% safe and secure, and also utilizes new 3D secure technology such as Verified by Visa and Mastercard SecureCode for added protection. How Many Logs for Winter? This is a common question from our customers that are new to wood burning, and it’s a good one; stacked firewood vs loose-filled bags are vastly different in the volume of logs they provide which can complicate matters further when you’re not sure what sort of volume of logs for winter you need in the first place! Generally speaking, casual use of wood burners (and by casual I mean using during the evenings and weekends) shouldn’t require any more than 2 cubic metres (loose) or 1 cubic meter stacked, give or take a little. Our 1 cubic meter stacked crate (Small Crate) contains approximately 1.28m3 when loose. Using your wood burning all-day long uses a good amount of logs each day and generally requires between 3-4 cubic meters of loose logs per season, with the vast majority of our customers that burn intensively purchasing our Extra Large Crate – the equivalent to almost 3 cubic meter loose, which should last the winter season unless you have multiple stoves or are heating a rather large area. It’s worth mentioning that our customers that use multiple stoves intensively often purchase 2 of our 2m3 Large Crates per season – by far the best way value-wise to purchase firewood is with our stacked crates. View our kiln dried logs and find the solution that’s right for you. When you’ve had your log burner installed the biggest and most important decision is which logs to burn. With so many different species and varieties of logs on the market, discerning the value and efficiency of them all isn’t easy, and it’s not a simple case of throwing in any old wood or using the cheapest you can find; that’s the fastest way to start causing damage to your flue lining. A photo of the ash hardwood logs we supply in stacked crates. Click the image to view all of our logs for sale. The simplest way to breakdown the different logs available is to split them in to two categories – softwood and hardwood, the latter being more dense and thus longer burning, releasing their energy over a prolonged period of time, rather than faster burning softwood species were you spend more time opening the door on your stove and feeding logs, rather than sitting back and enjoying your wood burner. Softwood species also crackle and spit more (often damaging carpet when opening the stove door!) and also generate more smoke than hardwoods. Both hardwood and softwood generate the same amount of heat, however due to the density you would require twice the volume of softwood logs for the same heat output than hardwood logs – which is one of the reasons buying hardwood logs is much better value. For these reasons we do not recommend burning softwoods in log burners, and only for when used as kindling, which softwood is perfect for. Due to hardwood being twice as dense as softwood, it takes a lot longer to season naturally and in the British climate this could take anything up to 3 years before the logs are suitable for wood burning – this is where most local suppliers and traditional seasoned logs suppliers struggle, especially when demand is high and they’re forced to sell stock that’s still seasoning once winter is in full swing. This is why chimney sweeps and stove manufacturers will normally recommend kiln dried hardwood as the best logs to burn. Trying to burn wet, partially seasoned hardwood is the worst kind of wood to burn and simply will not light or generate any heat at all, making purchasing seasoned hardwood very risky unless you own a moisture meter and take external and internal readings. Since the invention of the kiln for drying firewood by using heat and humidity control, the firewood industry has changed dramatically. Now it’s possible to buy extremely dry and ready to burn logs all-year round, and because it’s a faster turnaround from felling trees and drying the logs, it’s much more economical meaning the value of kiln dried logs when compared to naturally seasoned logs is huge – not only in a dramatically lower moisture content but in price, especially when comparing heat output per units. Often we are contacted by customers asking what the differences are between birch vs ash logs, primarily interested in the facts regarding the heat output and burn characteristics of the two species. Being slightly less dense than ash, birch logs provide slightly more heat upfront, therefore are great if you only use your stove for a few hours in the evening or at the weekends; your stove gets hotter quicker and the space you’re trying to heat will get up to temperature very quickly. Ash logs offer a longer sustained burn and are more suitable for medium usage – 5-6 hours per night, for example. The only other real difference in burning characteristics other than heat output and burn time is that birch produces slightly more smoke than ash – nothing significant, but a fact none the less. If you are a very casual user of your stove, birch is probably the best option, however if you use your stove more regular than we would recommend either ash or oak for very intensive use. View our homepage to learn more about our kiln dried logs and view our products. We currently only have only 4 of our Extra Large Crates left while awaiting arrival of our winter stock from our producer, after which our summer sale will be over and they will revert back to the regular price of £279 in September. With only 3 weeks to go until temperatures continue to decline, don’t miss out on our best value crate – approximately the equivalent of 4 “ton” bags and roughly 2.8m3 when loose. Are Firewood Crates Getting Smaller? Should Log Stores Be Slatted Or Solid? What Size Log Store Do I Need? Which Direction Should My Log Store Face?